f(x) = bx ; where b > 0 , b≠ 1, and x is any real number. 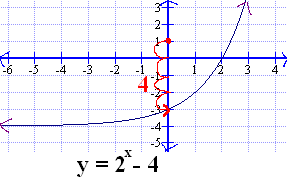 7)	graph passes the horizontal line test ----> its inverse is also a function. 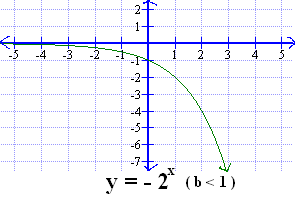 8)	graph is asymptotic to the x-axis -----> gets very, very close to the x-axis but does not touch it or cross it. 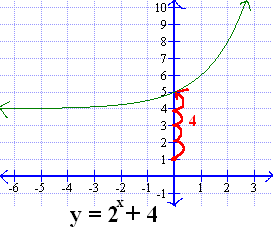 1)	y = b x , b>1 , the graph will be increasing from right to left in upward direction i.e. from negative x-axis to positive y-axis. 2)	y = - b x , b<1, the graph will be decreasing right to left in downward direction i.e. from negative x-axis to negative y-axis. 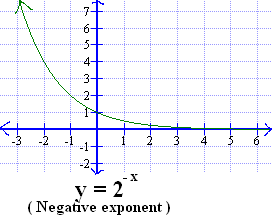 3)	y = b -x when the exponent is negative. The graph will be from left to right in upward direction i.e. from positive x-axis to positive y-axis. 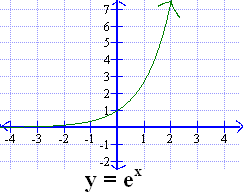 The inverse of the exponential function is the Logarithmic function.